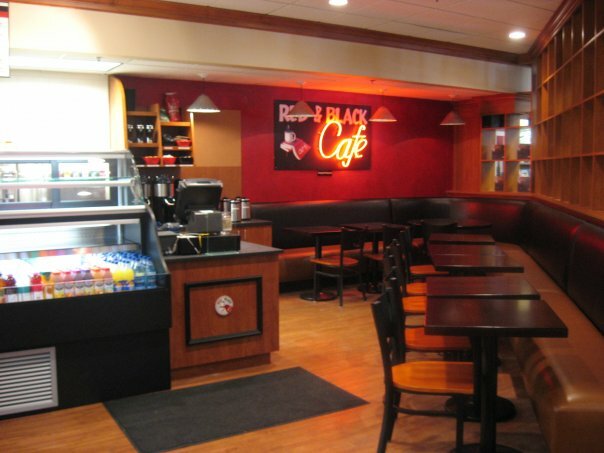 The Red & Black Cafe was founded in 2003 by Edward Thorndike ’89 and Karen Kaffen-Polascik. We took over the former Atticus Cafe and while we completely redesigned the menu and the decor, we maintained the two most important elements…the bread and the staff. We continue to feature the Chabaso breads in our Panini and specials. Of the six full and part-time staff members, four still remain with us today. Our everyday menu features panini made from fresh ingredients, original soups and breakfast sandwiches served all day. Our specials have grown over the years and now include a wide variety of hot and cold sandwiches including our tender chicken cutlets, homemade meatballs and lightly fried eggplant. We offer a large selection of fair trade coffees from around the world, chai teas and our very popular, freshly made fruit smoothies. On weekends our brunch include dozens of creative omelets and other egg specials, which are served all day.